Hartland Community Education can trace its roots back to the Hartland Area Project founded by local philanthropist Mr. John Robert Crouse, Sr. in 1933. The Hartland Area Project was a far-reaching plan designed to improve the health, social and educational conditions of the citizens of Hartland. As part of the project a Minster of Education was established. This position was the forerunner to the position of Director of Community Education. The function of the Minister of Education was to coordinate the teaching of enrichment, high school completion, and associate degree level college classes for adult members of the Hartland community. These classes were taught in the evenings by the Hartland Consolidated Schools faculty. Classes were held in the original high school, called the 1921 building. After the death of Mr. Crouse, Sr. in 1947, the Hartland Area Project continued but began to fade in the 1950s and 1960s. In 1970, the position of Director of Hartland Community Education was established and Mr. Larry Flowers was hired. 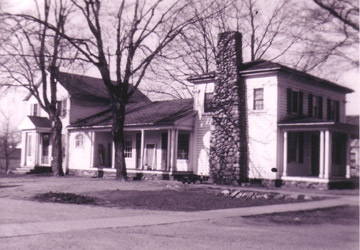 The Community Education Department was housed in the Cook farmhouse, which stood in front of the new Hartland High School on M-59. Here the programs began to expand once more offering high school completion classes, youth and adult recreational programs and a number of enrichment classes. In 1984, Hartland Community Education joined the Huron Valley Schools Community Education Consortium and was operated for the next four years by the Huron Valley Public Schools. 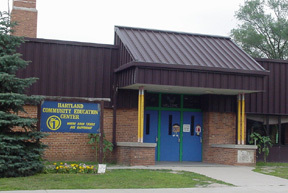 The Hartland Community Education program began to take its present form in 1988. It moved from a small office in Hartland High School (M-59 location) to the Village Primary School (1951 Building) in 1988. The building was renamed the Hartland Community Education Center. On July 1, 1988, Mr. Stephen Assenmacher was named Director. 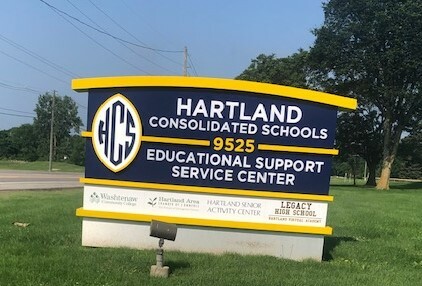 One year later the community education department was brought back under the control of Hartland Consolidated Schools and began to grow significantly. In August 1988, the facility announced the opening of a new Day Care Center. Latchkey Service for students who needed before an after school supervision was also added and many new programs launched. Dance programs were started ad the gymnastics program expanded to become the largest community education run gymnastics program in the state. Evening enrichment classes were provided along with adult education programs. Over the next fifteen years, the Hartland Community Education Department would double, triple and quadruple in size. During the 1990s, Hartland Community Education continued to grow receiving numerous grants enabling new programs to be created, including a new alternative education program. Today, Hartland Community Education stands a s a model for other programs throughout Michigan and around the country offering classes and services for infants through senior citizens. Hartland Community Education remains completely self-funded. Community Education receives no money from the school district’s general fund. The program has been featured in tow national publications and is often visited by groups from the National Community Education Center. In 2004, the Community Education Office moved to their current location-the Hartland Educational Support Service Center on Highland Rd (M-59). This move provided added space needed to meet the needs of our growing population. Housed in this building is the Hartland Gymnastics Academy, the Hartland Senior Center, a wonderful computer lab for the alternative ed high school students and a lab for adult evening computer courses, Preschool, the LEGACY alternative high school program, Dance Expressions, and many more fitness and recreational programs available now with a full size gym, outdoor track, tennis courts and fitness rooms. In 2005, Mr. Stephen Assenmacher retired from Hartland Community Education after serving as Director for 17 years. He helped to shape the Community Education Department into a vital part of the Hartland community. Michelle Otis was selected to become the new Director on July 1, 2005. Mrs. Otis continues to provide excellent programs and is committed to carrying on the rich legacy of Hartland Community Education for all of the residents of the Hartland Consolidated Schools District.